Beijing is wooing continental leaders like Germany’s Angela Merkel, hoping for allies against Trump. Despite some common interests, Brussels is sceptical of China’s market opening gestures, plus it still needs U.S. security guarantees. Sweet free trade nothings won’t cut it. Germany and China signed some 20 billion euros ($23.5 billion) of commercial deals on July 9, marking a visit to the continent by Chinese Premier Li Keqiang. 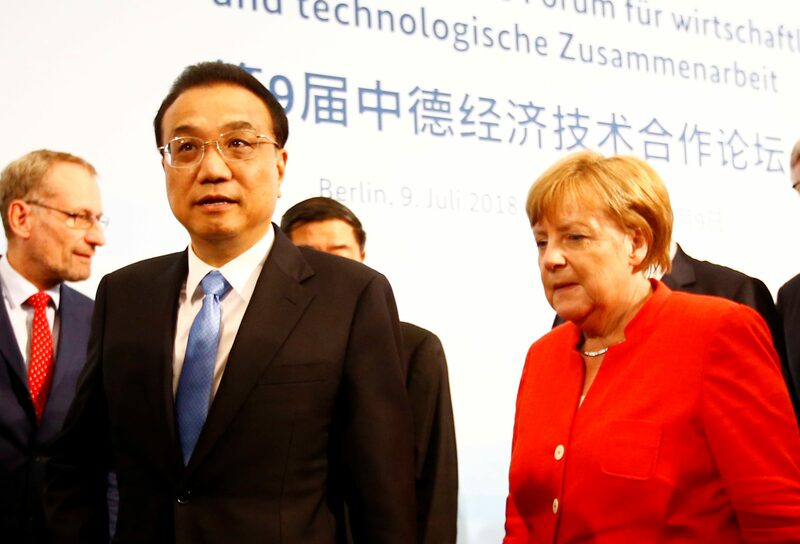 At a joint press conference, Li and German Chancellor Angela Merkel expressed support for the World Trade Organization and emphasized the need for free trade. Li said the intellectual property of German firms in China would be protected. Chinese officials are pressuring their European counterparts to form a united front against United States trade policy ahead of a planned EU-China summit, Reuters reported. The European Union Chamber of Commerce in China released a report on July 10 arguing that “urgent actions” are needed to address issues such as state-owned enterprises and an unfavourable regulatory environment.